Lockheed’s April 2017 study shows that, with a simple upgrade, Belgium’s F-16 fighters could remain in service until their retirement begins in 2029 and is completed in 2041. Twenty operational aircraft would remain operational until January 2035. PARIS --- The future of Belgium’s competition to select a new fighter aircraft is uncertain today, after the government was accused yesterday of hiding from Parliament that a cheaper upgrade option was available, and of misleading Parliament by wrongly claiming an urgent purchase was required. The Belgian government has always maintained that a service life extension was not feasible, and that the F-16s would have to be retired beginning in 2023, to explain its decision to launch a €3.6 billion competition to replace the F-16s. The air force kept this option under wraps and did not tell the government it existed, Defense Minister Steven Vandeput said Tuesday. He said “the managers of the F-16 fleet made a serious error of judgement,” and denied any knowledge of the upgrade option. Any talk of an extension program is however ruled out by the minister, who according to La Libre told the lower house’s defense committee on Tuesday afternoon that, before deciding to buy a new fighter, the government had studied all possible scenarios allowing it to maintain the required operational capabilities. But the two Lockheed studies reveal that there is no urgency to replace the F-16s, and that Belgium can wait until 2029 -- and not 2023, as claimed by the government -- to begin to retire them. According to the newspapers, extending their service life would cost about €1 billion, or about one-quarter of the cost of buying new fighters. 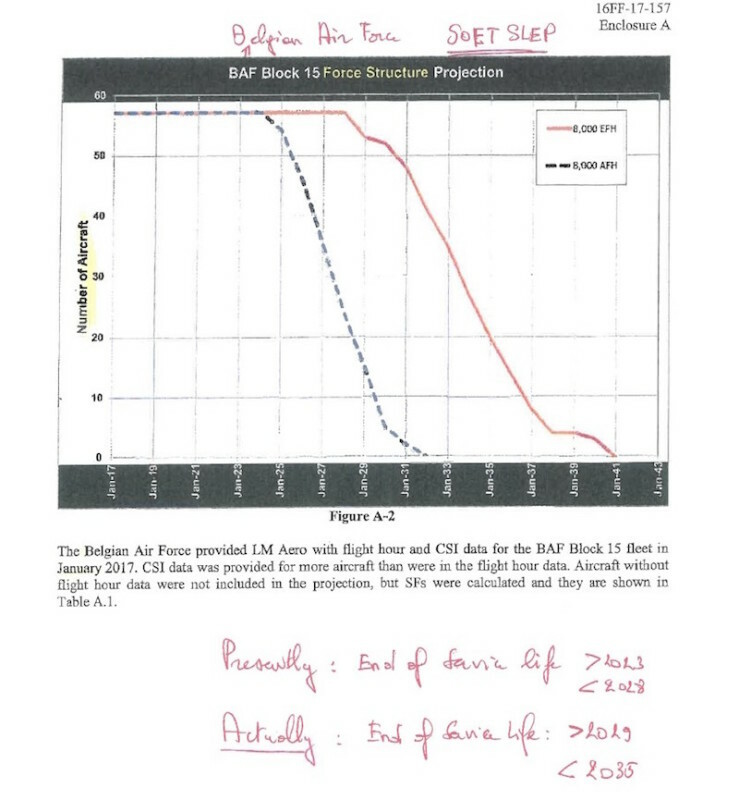 Having examined both documents, Defense-Aerospace.com can add that, with a simple “Soft SLEP” upgrade, 20 of Belgium’s F-16s could remain in service until 2035, although one of the studies mentions a possible life extension of 27 years. “I don’t know if the minister has read the report…...but he should have known about it. 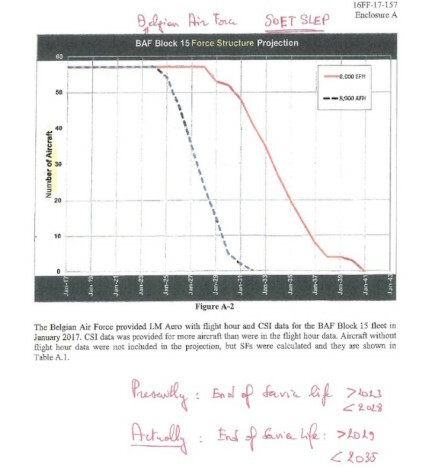 Vandeput told Parliament two things that are not true”, Crombez continued: that the F-16s need to be replaced urgently, and that no study existed about a life extension program. As the issue unfolds, more information is surfacing. La Libre, for example, reported Tuesday night that last year Lockheed had approached Vandeput’s deputy chief of staff, Simon Put, to offer him a job. When he found this out, Vandeput fired Put, as he was afraid of that public perceptions of such talks. Put, according to La Libre, is now employed by Lockheed, and apparently the company’s conduct in this respect has not raised any eyebrows. In a round of interviews later Tuesday morning, and in urgent testimony before Parliament’s defense committee in the early afternoon, Vandeput repeatedly stated that he knew nothing of the Lockheed study until it was reported on Tuesday morning, and that the Chief of the Defense Staff had likewise not been informed. However, he maintained that he saw no reason to cancel the competition, although the government should take this development into account if it was confirmed. -- Minister @svandeput: F-16s to fly longer to 2034 can cost up to 2.2 billion euros extra. Is that the choice we want to make? Knowing that we are then operational no longer relevant?